Trump supporters walk around City Hall on Saturday, March 25, 2017. The march was headed to the Philadelphia Museum of Art, but it would be turned back by police. Less than 100 people turned out for the Pennsylvania Make America Great Again March at Independence Hall Saturday – a crowd that drew more protesters and police combined than supporters of the president. The minor clashes didn't come as much of a surprise. 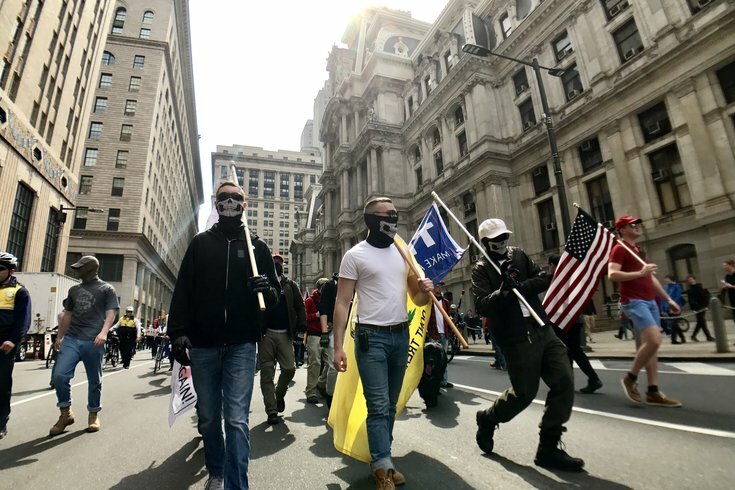 When word arose of the pro-Trump rally happening in Philadelphia, a #DisruptMAGA event quickly formed. The pro-Trump event, scheduled for 11:30 a.m., was delayed by the Philadelphia police out of safety concerns for those involved. The march finally kicked off around 2 p.m. and was peaceful mostly until things got a bit tense at City Hall, as the anti-Trump crowd shouted phrases like "You are racist!" and Trump supporters shouted back lines like "Four more years!" It appears there was just one arrest, of a "resistance" protester after a flag was burned on Independence Mall. About 100 Antifa protesters participated along with dozens of police officers who oversaw the events. While the march unfolded around Center City, many took to Twitter and Facebook to voice their opinions. The response was mixed Saturday afternoon, to say the least. Those who sided with the "resistance" made jabs about the crowd size – one remarked that the Mummers have a better turnout for their rehearsals. Others called for Trump's impeachment. Some questioned why they came to Philadelphia at all since Trump won the presidency during the November 2016 election. But pro-Trump supporters called the protesters "cowards," while others expressed gratification to those who came out despite the predicted face-off. @thephillyvoice @ChelleLBI @realDonaldTrump Anti-Trumps covering their faces like cowards. Afraid mom will see kick them out of basement. Others praised the supporter's ability to refrain from violence or "looting." But many remained neutral, asking why the marches – on either side – were happening at all while some just supported both sides' right to voice their thoughts. Some hated what was going on entirely. For others, it brought out the inner entrepreneur. Read more coverage of Saturday's march from PhillyVoice reporter John Kopp here.